It has come to my attention that not all of you got the memo, so I just wanted to step up again. Summer is over, and Thingmonk is here to once again kick off the Autumn/Winter Season 2017. Our program is looking better than ever this year: with crisp and interesting talks on data, user experience and software development for IoT. Come for the lovely people, stay for the deep and entertaining talks from people building platforms, services and apps that matter. We have a few tickets left. You should buy one here sharpish – the conference is next week. Our theme this year is how to build “Digital Twins” – digital models that track the lifecycle of a product or service from idea through design and build, to ongoing maintenance and support. We’re planning an epic coding workshop, led and sponsored by IBM and Microsoft. It’s won’t be competitive, but it will be fun for all ability levels, with plenty of supportive folks around. Our 2017 diversity scholarships are sponsored by Salesforce. Rather than just giving out some tickets to underrepresented groups in tech, we run an ongoing program, with on the day mentoring, free business cards from MOO.com for scholars, and after the event support. This year we helped Isaiah Wellington-Lynn raise enough money to spend a year in the States at Harvard, and more recently Ivan Beckley, another alumni, got funding to spend a year learning data science to add to his impressive medical credentials. Congratulations to both of them! Bright futures ahead and we’ll provide support in any way we can. @juanage, aka Juan Perez, product manager for Microsoft Azure IoT Hub device management, will explain exactly what a Digital Twin is, where the idea came from, and what it means to manage digital twins at Cloud scale. Maker, author & @UKRobotWars judge @DrLucyRogers will give a preview of her soon to be published “Wiring the Internet of Things”. Lucy is adept at bringing ideas to life, be it animatronic dinosaurs at Blackgang Chine Theme Park, or miniature mannequins for marketing bespoke dresses. @racarter, CEO of Field Margin, will explain how to create a digital twin of a farm, tracking the planting lifecycle from season to season to increase crop yields with better monitoring and automation in an era of increased climate uncertainty and public concern about the use of pesticides. @SMC_on_IOT aka Dr Sarah Cooper, AWS’s GM of IoT Analytics and Solutions, will help us understand how to keep data under control, when we’re throwing so many variables and data sources into the mix, crucial in building useable models at scale. 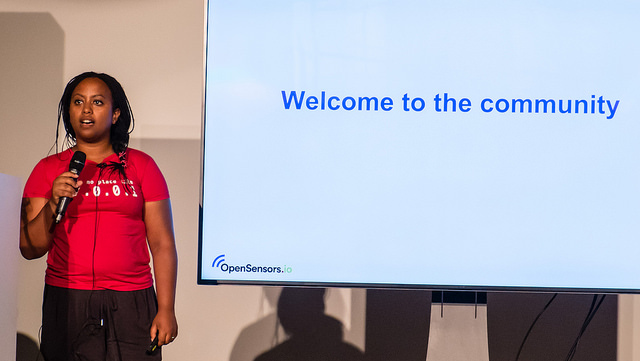 @YoditStanton, founder of OpenSensors.io, and a firm favourite of the Thingmonk community will return to build on her vision of building more livable environments, buildings and spaces in her unique, wise and funny style. @thinkovation,Gary Barnett is CTO for Airsensa.org, a non-profit IoT startup will outline what it means to better understand pollution and air quality using sensor networks. How digital twins of the natural environment can help keep us healthier and act more sustainably. Gary is also an industry analyst, at another firm, Current Analysis, which might seem odd, but our events are not about us, they are about the community at large. Other speakers include Abby Kearns, Executive Director of the Cloud Foundry Foundation, Johan Stokking, co-founder of The Things Network, Kamil Baczkowicz, Full-Stack Technical Architect at Resonate (sensor networks for the UK Rail network), Clemens Vasters, Lead Architect, Azure Messaging Services (yes, we think Microsoft will be kind of a big deal in IoT), Ben Stopford architect at Confluent Inc (Kafka), Tracy Miranda, founder Kichwa Coders, Charlie Isaacs, Salesforce. One cool session will be a joint effort between Andy Stanford Clark of IBM and Martin Gale of Salesforce – we encourage a collegiate atmosphere at our conferences and it’s great to see folks from vendors collaborate to tell stories and build cool things. The Eclipse Foundation is partnering with us again, with a half day of talks about Eclipse, industrial automation and modeling. I am looking forward to the talk about learning more about tracking sleeping patterns for better health. Bottom line – the conference is looking great. We look forward to seeing you there.